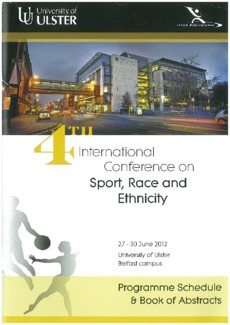 Research which specifically challenges stereotypes, discrimination and racism involving Muslim women in sport and physical education contexts in non-Islamic countries has become the subject of a growing number of international research projects (Ahmad, 201 l;Benn, Dagkas, & Jawad, 2011; McCue & Kourouche, 2010; Walseth, 2006). This study contributes to the development of this knowledge by examining how three sport settings located in a large Australian city, embraced cultural change and developed more inclusive community sport environments for Muslim women and girls through social inclusion facilitation. The paper focuses on the relational and power dimensions of social inclusion and how these are deployed by sport organisations to challenge false universalisms and to promote participation. The processes involved in the (re)construction of social identity, the development of agency, opportunities for active citizenship and the development o,f social relationships through participation in community sport are explored. Confronting traditional community sport practices involving sports attire and participation in mixed sport settings has led to the development of new sportswear (such as the hijood), Muslim women as sporting role models, enhanced opportunities for Muslim women as sports leaders and greater employment chances for Muslim women in roles such as life-guards and swimming teachers. 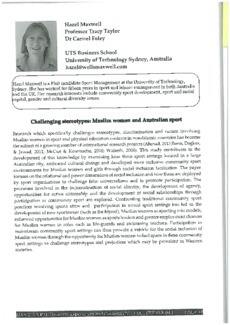 Participation in mainstream community sport settings can thus provide a vehicle for the social inclusion of Muslim women through the opportunity for Muslim women to find space in these community sport settings to challenge stereotypes and prejudices which may be prevalent in Western societies.